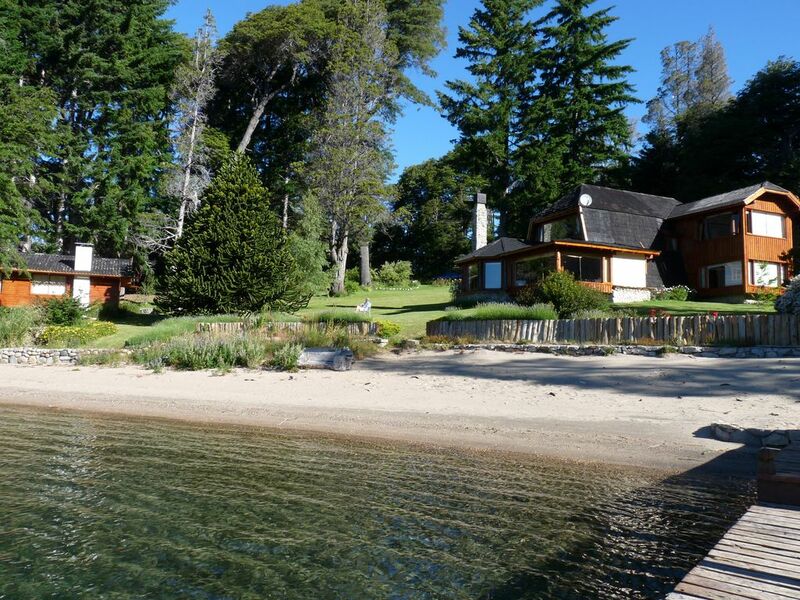 Bariloche Lake Front is an unparalleled beach front property, located on over a half acre of lakefront, nestled on the shores of Lago Moreno West, in its own secluded bay. The 3 bedroom, 2 bath house is over 2,400 square feet and is a beautiful, open floor plan that offers gorgeous views from a majority of the rooms. It has about 200 feet of coastline and beautiful sandy beach, something that is a rare find among the shores of Bariloche. It also has its own dock, offering easy accessibility to the water. For an extra rental fee, there is also a one-bedroom, half-bath, casita with small fridge and 2-burner stove available. The property is more than a half acre, fully landscaped, receives sun from mid-morning, and is very private, with a remote-controlled electric gate and an automatic natural gas backup generator. Frequent maid service is included. This is a very special lakefront vacation rental. Two week minimum in low season. Bariloche is the premier mountain resort destination in all of South America. Electronic gate, alarm, internet, automatic backup generator. Naheuelwapi National Park 5 minutes to trails. Beach in front of house. Laundry at house. Parking for RV/Boat/Trailer. Catering Available: Full Kitchen: adjacent breakfast nook. Beachfront, Lakefront. Mountain View: Cerro Lopez and Vista Panaramico are minutes away. Alternative Lifestyle. Excellent Property!!! It exceed our expectations. Published Photos do not reflect its real beauty. House and garden are incredible. Furniture, beds, home appliances, towels.... lot of details that will make your stay perfect!. Gardener and house keeping are great too. My Family loved our 10 days there. Including Neighbour’s dogs: Chacha, Pepe and Max. This house was perfect. The Bandurias (white faced Ibis) love it here, as do the Cara Cara Hawks, and the upland geese. The sound of the lake laping at the shore put us to sleep every night. The near by French restaurant was great and we paddled to the Llao Llao penninsula. Tudo conforme combinado e o lugar acima das minhas expectativas, voltarei de novo ! Boas acomodações, casa bem equipada e com excelente conforto ambiental, tudo funciona bem e de boa qualidade.